Download this free Weight Loss Tracker to enter target weight, and weekly weight loss goals, then record your weight each week. With this Weight Loss Tracker, you can enter your target weight, and weekly weight loss goals, then record your weight each week. On the dashboard, a chart shows your progress, and you can see the remaining weight loss required to reach your target. Warning: Please consult your doctor for recommended target weight and weekly weight loss goals. 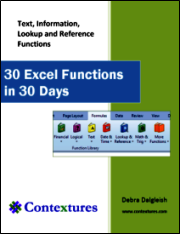 This workbook does not contain any qualified medical advice -- it is a recording tool only. 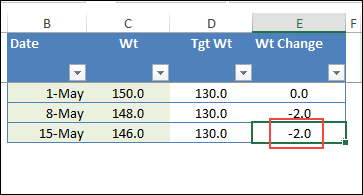 On the WeightGoals worksheet in the Excel Weight Loss Tracker file, there are cells where you can enter your personal data and goals. Note: The worksheets are protected, with no password. First, select the measurement system that you want to use -- either pounds or kilograms. Next, fill in your personal data and targets. The Excel Weight Loss Tracker also has information on Body Mass Index (BMI) from the Center for Disease Control and Prevention. After you enter your personal data, the WeightGoals sheet calculates your current BMI, and target BMI, and shows the ideal weight range for your height. This is general information, so speak to your doctor about this measurement, and how it might apply to you. 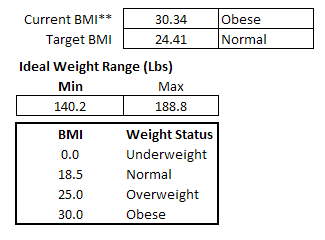 The BMI table is used as a lookup table for the ratings for the current BMI and Target BMI. The Minimum and Maximum ideal weight range is calculated from your height, and the Normal range in the BMI table. After your personal data and targets are entered, you can start recording your weekly results. 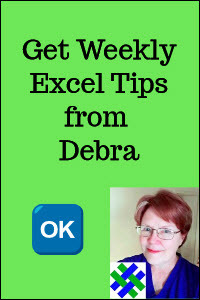 Go to the WeightTracker sheet, where weekly weights are entered. It also calculates the weekly weight change. Click in the Date column, in the first blank row. Enter the date, and your current weight, and the change is automatically calculated. 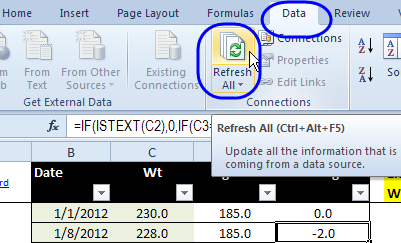 After you enter the data, click the Refresh All button, on the Ribbon's Data tab. 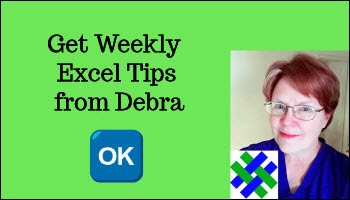 This will update the pivot table, where your data is summarized. Your weight loss results are summarized in the Dashboard, with a simple line chart to show the recorded weights, and your target weight. 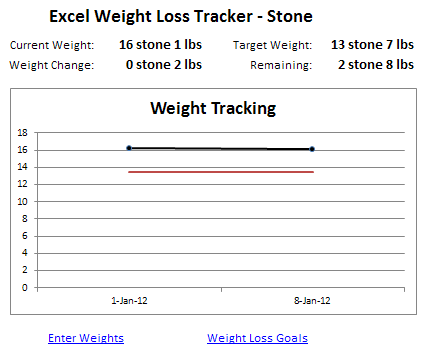 You can also see your current and target weights, the total weight change, and shows how much weight remains to lose. If you prefer to measure your weight loss in stone and pounds, there is also a version for that measurement system. 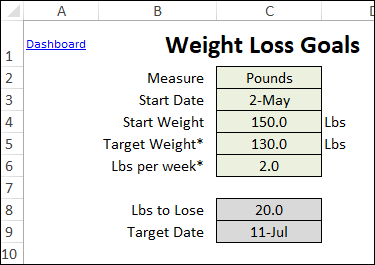 The Weight Goals sheet looks slightly different, and your dashboard shows stone and pounds. 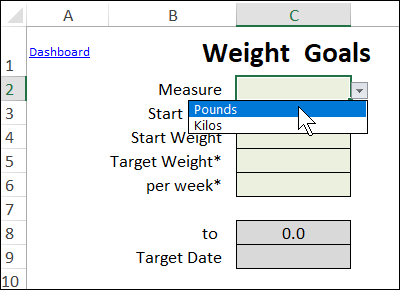 Excel 2007 and Later: Download a zipped copy of the Weight Loss Tracker, and try it for yourself. The sheets are protected, with the green cells unlocked, and there's no password on the worksheets. 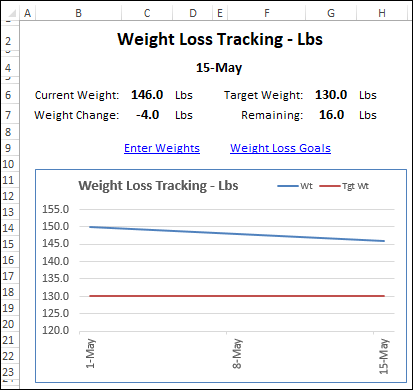 Excel 2003: Download the Excel 2003 version of the weight loss tracker. 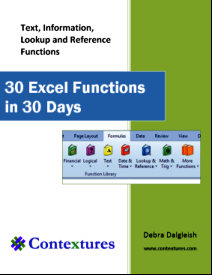 These files have most of the same features as the newer versions, but they contain a set data entry range, instead of a formatted Excel table.